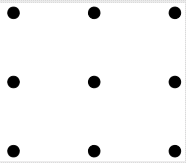 What is the minimum number of STRAIGHT LINES required to join all the 9 points at least once without removing pen/pencil from the paper even once? (1)The lines can cross each each other!! (2)maybe the above hint is of no use to you! !